This summer I entered the Research Experience for Summer Scholars (RESS) program, so I could study zooarchaeology more intensively. The program and the research led to a great experience for me to have during my undergraduate years. Generally, I spent most of my time conducting my research, which was faunal analysis from previous excavations at the Johnston site (36IN0002). For my project, I identified and analyzed faunal remains from the western section of the site, that were recovered during the 2012 excavations. Specifically, I identified bones to their elements, genus, and species when applicable. This project has really been able to help me work on my identification skills and to solidify my desire to study zooarchaeology. Besides conducting research, I participated is RESS events, which included workshops, presentations, and social events. The social events were fun, because it allowed me the chance to spend time with like-minded people in different fields, which is what this whole program was about. This program allowed me the opportunity to meet other student researchers, as well as gain necessary skills for conducting research. I really enjoyed this program and I would recommend it for others who wish to conduct summer research here at IUP. 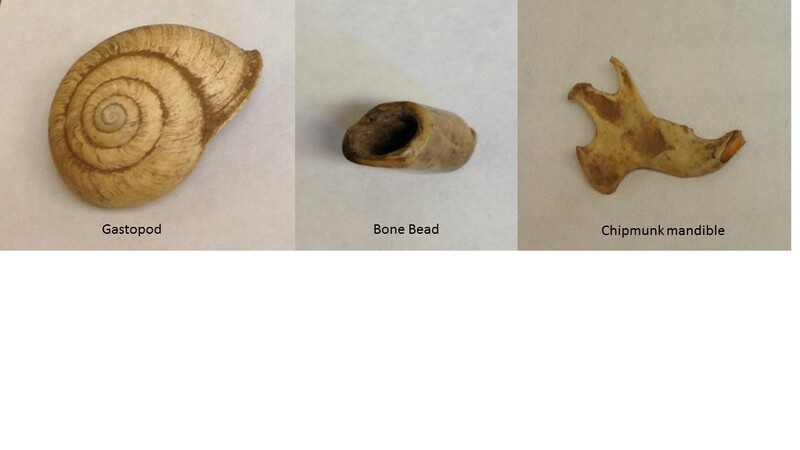 faunal material from the Johnston Site excavations. 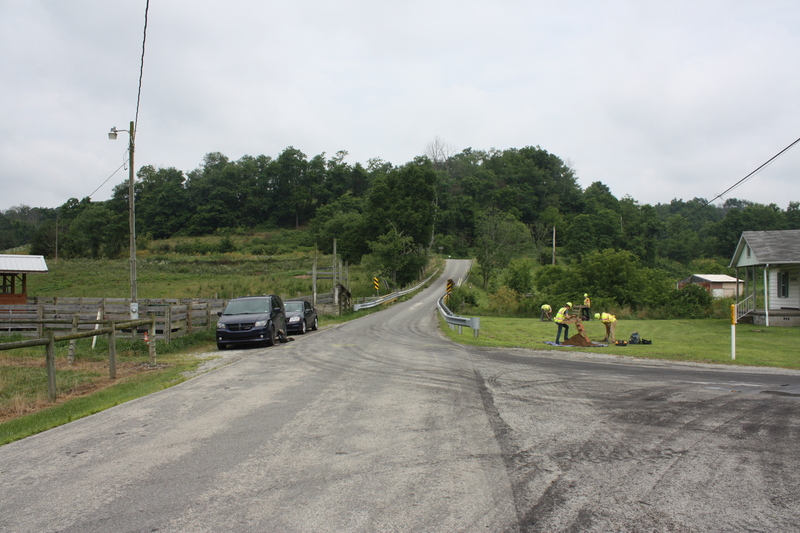 Each summer, PennDOT hires a field crew to gain experience running archaeological surveys as part of the environmental clearance for PA’s multitude of transportation-related construction projects. PHAST (PennDOT’s Highway Archaeological Survey Team) is supervised by an IUP graduate student enrolled in the Applied Archaeology MA program – that’s me. This year’s PHAST crew is comprised of three IUP grad students: Genevieve Everett, Sami Taylor, and Zaakiyah Cua. 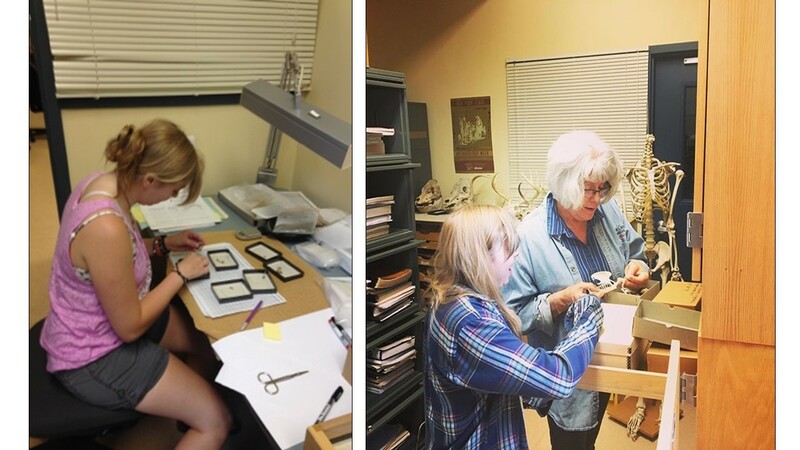 The intricacies of completing archaeological field work in a cultural resource management (CRM) setting can be difficult to fully grasp in a classroom setting, and PHAST allows students to gain valuable working experience and hone their field skills. Covering the entire state of Pennsylvania, the PHAST crew has a wide variety of projects. The project list and schedule are in a constant state of flux, and the unpredictability of CRM work is readily apparent. Jobs scheduled for a whole week of field work may be completed ahead of schedule if no archaeological sites are found, or if the project area has already been disturbed by modern activity. Similarly, jobs scheduled for a day of work may stretch on for weeks if a site is encountered, or if testing goes especially deep (our .57-cm diameter shovel test occasionally reach a depth of 1-meter before we encounter an appropriate stopping point). CRM work forces you to constantly reassess the situation based on new information, from the planning stages to the actual field work. This summer started off with a bang. We encountered a prehistoric lithic reduction site on our first project, located in Allegheny County near Chartiers Creek. Within a single 1m x 1m test unit, we recovered over 500 lithic artifacts – mostly flaking debris and cores associated with the production of stone tools. Encountering sites is exciting, but not a daily occurrence in CRM archaeology, as many of our projects since then attest to. Of the 11 projects we’ve completed field work for, only 3 contained sites. As busy as we’ve been traveling across the state from the Southwestern corner near Prosperity, PA to State College in the Center, and down to Muddy Creek Forks in Southern York County, it’s no wonder the summer is flying by. Helping out at the Hatch Site (see July 3 blog) for three weeks was the longest we’ve been in the same spot, and gave us a rare CRM opportunity to work on a full-scale data recovery project at a known archaeological site. Nearing our final month of field work we have 4 projects that need to be completed. Two consist of the standard survey method of shovel testing the project areas for bridge replacements in Jefferson and Washington Counties, while the other two are Ground-Penetrating Radar (GPR) surveys to try and locate a French-Indian War Fort in Lehigh County and out-buildings associated with one of the homes in Old Economy Village. There’s always the potential that a few small projects will pop-up before the end of August when classes start and the PHAST crew moves indoors to focus on the lab work, curation, and report writing. The crew will be employed by PennDOT through the end of October, but I’ll remain the PHAST director until May of 2019 when I graduate – stay tuned for more updates! 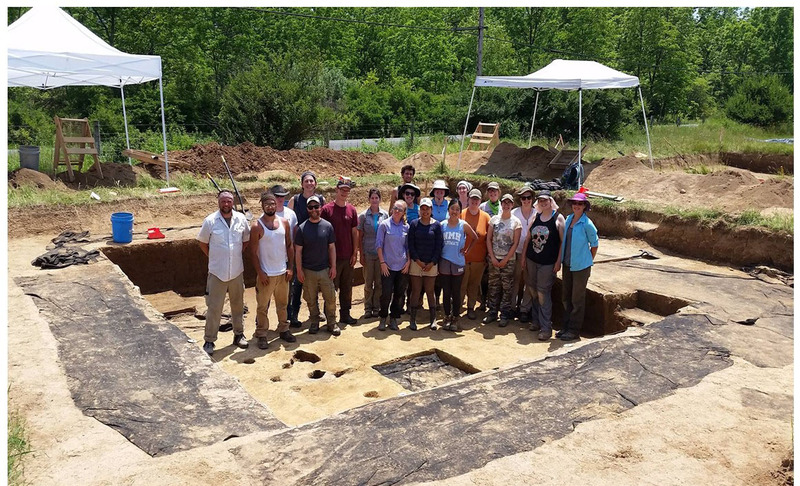 After classes ended this spring, I had the opportunity and privilege to help supervise the Juniata College Archaeological Field School alongside my former classmate Kate Peresolak and under the direction of Dr. Jonathan Burns of Juniata College. Located in State College, Pennsylvania, the project was a unique experience for a field school because it was a real-world Phase III archaeological project serving as a mitigation for a bike path that will soon have an adverse effect on the site. The James W. Hatch Site, named for the late Penn State University professor, is a lithic reduction site. In other words, this location served as a place where Native Americans would bring nodules of local lithic materials to be worked into stone tools. In this case, the local materials were being quarried from a source of jasper known as the Tudek Quarry at the top of the hill from the Hatch Site. This site was first discovered during a Phase I and subsequent Phase II project in the summer of 2015 by the PennDOT Highway Archaeological Survey Team (PHAST). This work determined that the Hatch Site was eligible for the National Register of Historic Places and the threat of destruction by the bike path required that some sort of mitigation of the site be conducted. In the spirit of creative mitigation, it was decided that an excellent way to include the public, educate students, and of course save money was to make the project a field school for undergraduate students. A total of 11 students participated in the field school from Penn State University, Juniata College, and Virginia Commonwealth University. 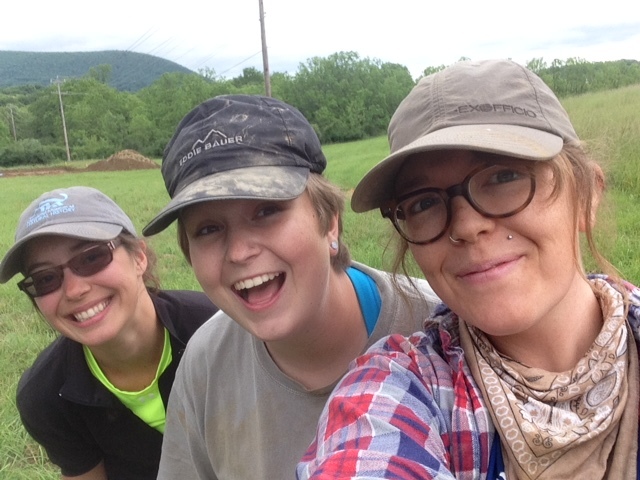 Also in the mix were a couple of hired field technicians, the PHAST crew (which consists of four IUP grad students), and several hard-working volunteers throughout the four-week excavation. We began this project by mechanically stripping the modern plow zone in two 10x10m blocks. Within these blocks, we used a total station to set up two 5x5m blocks to be excavated. The original plan was to excavate 1x1m test units within the blocks divided into 50x50cm quadrants and each screened in 10cm levels. We did this for about a day or two until we found some large chunks of slag at the bottom of the stratum previously thought to be undisturbed. Upon this discovery that the stratum was actually an older plow zone, our strategy changed to excavating the test units by stratum rather than excavating in 10cm levels by quadrants. Once we got through the deepest plow zone we returned to our original strategy in the clay beneath. Unfortunately, no diagnostic artifacts were found in the intact stratum, but we did find some projectile points in the old plow zone, including a Kirk corner-notched point! This gave the site an Early-Middle Archaic occupation and made the students more excited and motivated to keep up their hard work in the unpredictable weather conditions of central Pennsylvania. We also collected a few charcoal samples from features in the clay that will be radiocarbon-dated. This project was great for many reasons, but I will only list three main points here. First, it allowed students an opportunity to work on a real CRM project with a deadline. Second, we all had the opportunity to learn more about using a total station and how much time it saves. Third, the Hatch Site is one of many sites associated with my Master’s thesis, which involves synthesizing data from over 40 nearby archaeological sites unofficially collectively known as the Houserville Archaeological District. The result of my thesis will include an official nomination of the district to the National Register of Historic Places on the basis of its significance as a stone tool production locale in relation to the Tudek Quarry. The field school was an incredible way to get the public involved and teach students while conducting a necessary archaeological endeavor to collect data that would otherwise be lost forever. For more information and photos from the project check out the Juniata College Archaeology Facebook page and The Eclectic Bear blog by PennDOT archaeologist Joe Baker. A big thanks to all of the great students, crew, and volunteers who helped us move so much dirt, and to the many visitors we had over the four-week field school.